We introduced mountable Reach power strip last year. 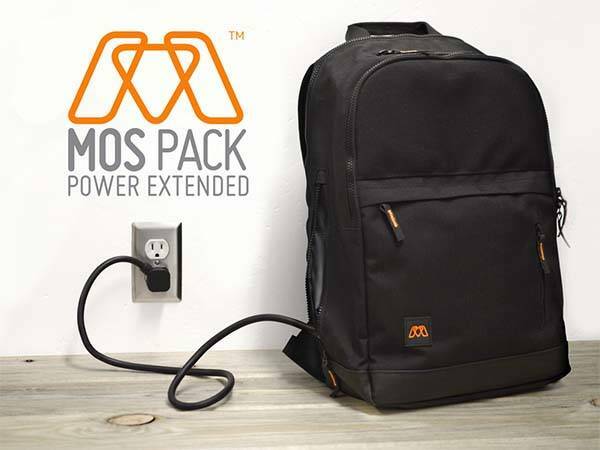 Now the inventor has integrated the Reach charger into the latest MOS Pack backpack. 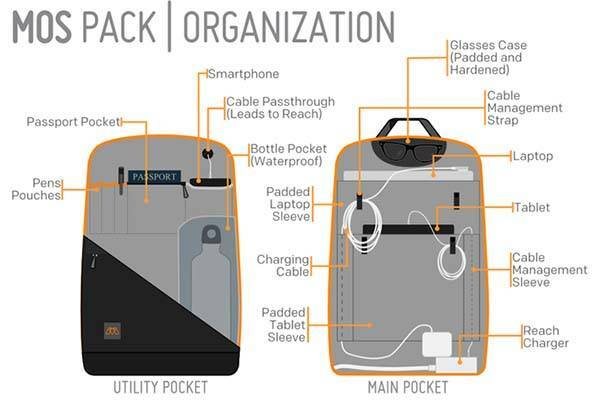 Using the built-in charger and cable organizer, the backpack lets you charge your devices with ease. The MOS Pack is a functional and versatile backpack that measures 18 x 12 x 5 inches and weights 2 lb 4 oz. As we can see from the images, the backpack has a sleek and low-profile look, and it’s constructed of anti-tear 1000d nylon and the bottom has been reinforced with an extra layer of rubber infused nylon in order to deliver us a durable and strong construction, meanwhile, its rigid support structure and soft backing provide you a comfortable wearing experience. The backpack has a 20 liters of storage space with multiple compartments, pockets, and slots that can hold your numerous items including up to 15″ laptop, up to 10″ x 8″ tablet, water bottle, books, cards, wallet, smartphone and etc. Most importantly, MOS Pack features a removable Reach power strip. 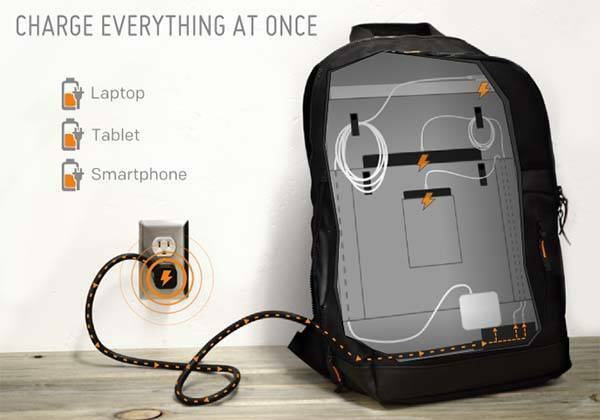 Using its two USB ports and one three-prong outlet, the Reach can connect up to three mobile devices, and a custom designed zipper lets you quickly access to the power strip so that you can conveniently charge your devices without needing to take them out from your MOS Pack. In addition, built-in cable management keeps the cables neat and orderly in the backpack. The crowdfunding for MOS Pack is ongoing on Kickstarter. You can pledge $99 to preorder the backpack. If reaching the $15,000 goal, It will be shipped in March 2016. BTW, also don’t miss iBackPack backpack and more related cool stuff by following tags. Update: the backpack has been available for $119.95 USD on Amazon.